We are truly a "Home away from home". Our customers quickly become family. Step into our lounge and hang out for an hour, it's a guaranty, you will feel like you're home. Randy and Alvin hung out at the previous location under a different owner and used to imagine owning a cigar lounge that would reflect their vibe and warm personality. After a couple of years, the shop became available for purchase, so they jumped on the opportunity. As they predicted, everyone loves the new vibe so much that the nickname floated around “Home away from home”. They quickly outgrew the space and moved to this new location. Mostly packed, when one of the usual’s walk in, it is such a pleasure seeing the handshaking and hugs to everyone already in the lounge. And the newcomers are quickly welcomed and integrated into the family. Why come to our lounge? We're always improving. Every feedback is valuable. When you arrive at our cigar lounge, you’ll walk into a humidor full of cigars. A knowledgeable tobacconist will guide you through our selection, matching a great cigar to your palate. A man or a woman with a cigar is held in high regards. 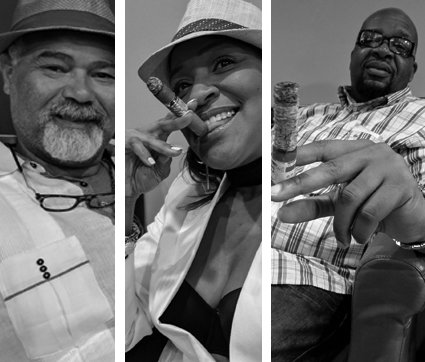 Celebrating a special occasion is often marked with holding a great cigar. Do not compromise. We offer a one-stop shop. All the accessories you need to enjoy a good cigar, from cutting to lighting and storing. Occasionally get great deals on our bundles. 10 - 20 % off. Host your private parties, company events, bachelor parties etc... in our lounge. Great setting, great vibe. We will help you impress your guests with a large and impressive variety of cigars. We also offer beer and wine. We can even arrange for catering. Did I also mention that we have domino tables and hookahs? The new location is amazing! Good ventilation, Good atmosphere! Good selection of Sticks! What makes Ashes a cut about the rest, is the “Family Environment!” No one that visits is a stranger! If you are visiting for the first time, by the time you leave you are Family! The Love at Ashes is abundant! In the event you should have a different experience, I will underwrite the of your purchase! The Best Cigar Bar in Kendall. A place to relax and smoke and watch Football with the guys, everyone seems to know each other here and greet everyone there is always good conversation here! Ashes cigar and lounge have to be my favorite cigar lounge in Kendall. The staff is extremely friendly and helpful. They have a great amount of knowledge on cigars, and they make fantastic Cuban coffee. The seats and couches are super comfortable as well.